Joe Wednesday afternoon found Jennifer with some unexpected free time, so we decided to make a trek to Göteborg's Sjöfartsmuseum. This is a very different affair from Maritiman: the Maritime Museum looks and feels like it was built by money from the industries of the harbor, back when there was money to be made there. It's full of exhibits about fishing, shipping, and the harbor itself, none of which appears to have been updated since the early 80s (at best). In other words, it's a fascinatingly quaint museum, with room after room of lovingly crafted little dioramas, most without a shred of English explanation. The elevator (which also dates from a number of decades ago) took us direct to the third floor, despite our rather explicit instructions to the contrary (unless that button labeled "2" holds some other meaning on the west coast…), so we started our tour in the fishing exhibit. 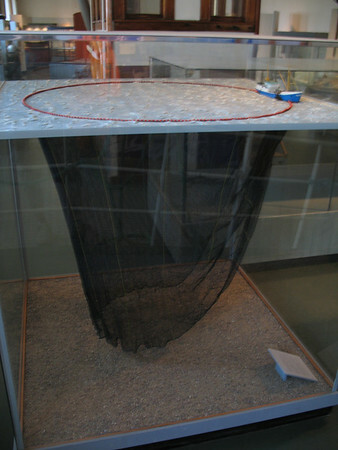 Here the history of Swedish fishing was recounted in a series of display cases demonstrating in miniature commercial fishing techniques over the centuries; each case had a few model boats up near the top, while the bulk of the diorama showed the configuration of the fishing nets under the water. These were strangely compelling, but they in no way prepared us for the Wes Craven-worthy horror which lurked at the far end of the hall: an automatic cod filleting machine (image may not be suitable for younger readers). 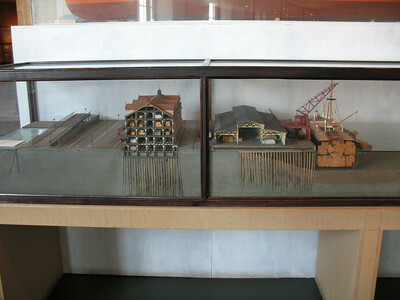 The shipyard displays were complete with functional models of large ship engines constructed here in the past, and layouts showing the way the shipyards looked before they all got turned into housing developments (I suspect a number of decades of urban decay fell between the former and the latter, but no need to dwell on that I suppose). The harbor room had not just models of all the individual quays, but also maps of the harbor dating back to the mid-1800s—showing, incidentally, that the "Red Stone " I mentioned in the gallery for the Älvsborg fortress post has been called that for at least the past 170 years. The museum also has a somewhat notable collection of ships' figureheads, but these are displayed without comment along the walls of the temporary exhibition space. The current exhibition was interesting, though. 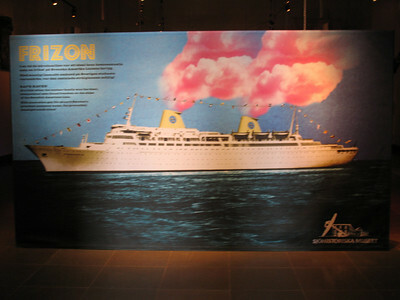 It was a collection of reminiscences by the gay men employed by the Swedish-American cruise line as stewards and waiters during the middle part of the century. Apparently it was something of an open secret at the time, the line going out of its way to hire attractive young men who were clean, interesting to talk to, and unlikely to get any of the wealthy young female passengers into a family way. The museum also touts its aquarium—the literature includes the line, "For many people it is the most memorable part of the exhibit! "—but there the passing years have not been so kind, I fear. No doubt I was influenced by having spent that very morning at Universeum, the city's new science museum with its own impressive aquarium. The older aquarium looks quite distinctly as though it's been looted of all its more interesting inhabitants to stock the new one, leaving it just a sad, oddly overlarge couple of rooms (the first room was thoroughly blessed with air conditioning though, which may have caused us to linger a bit). My favorite exhibit: a large tank displaying the "bounty of marine life in the Baltic," currently occupied by a single rather bored looking trout. Have you two been to the Dossin Great Lakes Museum on Belle Isle in Detroit? It has some pretty neat exhibits about shipping on the great lakes, including the entire men's smoking lounge from a rather fancy old ship. We never have, no. Sounds cool though! There's a little museum in South Haven that's nice, and we've visited Tall Ships when they've come by.